The gray whale (Eschrichtius robustus) passes Sea Lion Caves unusually close to shore on its northward journey because it has just rounded Cape Blanco, the westernmost extension of the United States mainland. It is seen for several months as individual timetables seem to vary in the whale's migration pattern. Small groups sometimes end their trip north and spend the summer in the immediate vicinity of Sea Lion Caves, feeding very close to shore. The gray whale is a mammal. It must breathe air and surfaces frequently to inhale and expel its condensed breath through the hole in the top of its head. It rarely swims more than 2,000 feet before surfacing to breathe and its spout is visible for a considerable distance. 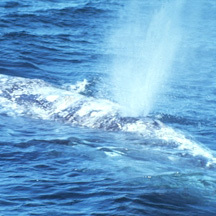 Gray whales live 50-70 years and when mature may reach 30 to 50 feet long and weigh 16 to 45 tons. It feeds off the bottom in relatively shallow water by plowing up the soft sandy sediments to obtain its main food, amphipods. Amphipods are crustaceans one-third to one inch long and are related to the common sand flea. The great gray whale has no biting structure to use for protection, and except for its size and endurance, is defenseless against attackers such as the killer whale. The common name of the whale comes from the gray patches and white mottling on its dark skin. Gray whales were once called devil fishbecause of their fighting behavior when hunted. The gray whale is the sole living species in the genus Eschrichtius, which in turn is the sole living genus in the family Eschrichtiidae. This mammal descended from filter-feeding whales that developed at the beginning of the Oligocene, over 30 million years ago. Dr. Raymond Gilmore, research curator of marine mammals at the San Diego Museum, believes that the gray whale actually remembers the contour of the coast it passes, and he speculates that from time to time the whale will lift from the water to take a bearing from prominent headlands. Heceta Head Light Station, just north of Sea Lion Caves, has been used for navigation by seamen since it was built in 1894. Since the gray whale travels at night, it is just possible that it borrows a page from coastal shipping and navigates partially by observing the 1 million candlepower white light that flashes every ten seconds with visibility for 21 miles at sea. 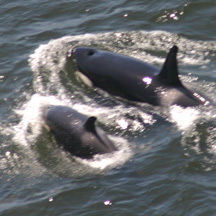 The killer whale (Orcinus orca) is not a frequent visitor to the Sea Lion Caves area. However, it is of considerable interest. This black and white mammal is one of the few sea mammals that attack other warm-blooded sea life, and has been seen taking sea lions in the vicinity, although its hunting ground is generally farther north, along the Washington coast. In the Pacific Ocean, the male killer whale attains a known length of about 27 feet and weighs an estimated 9 tons. A newborn calf is about eight feet long and weighs about 400 pounds. Killer whales are the largest members of the dolphin family. A typical killer whale distinctively bears a black back, white chest and sides, and a white patch above and behind the eye. It has a heavy and robust body with a large dorsal fin. Behind the fin, it has a dark grey saddle patch across the back. The killer whale's teeth are very strong and covered in enamel. Its jaws are a powerful gripping apparatus, as the upper teeth fall into the gaps between the lower teeth when the mouth is closed.